When the movie Ghost was released in 1990 it caused a real rumble, broke box office records, won one of its lead actresses an Academy Award, and caused the sales of Unchained Melody to skyrocket too! Eventually, like so many well-loved movies, it was adapted for stage and hit the West End in 2011, before heading off to Broadway to break hearts there too. Now producer Bill Kenwright's reimagined production of the musical is touring the UK, leaving countless watery eyes in its wake. Banker Sam and his artist girlfriend Molly are confronted by a mugger one night. When Sam attempts to wrestle a gun from the mugger's hands and ends up getting shot, Molly ends up alone... or so she thinks. It seems Sam has some unfinished business in the world, and with the help of psychic Oda Mae, he sets his mind to concocting revenge upon those who are responsible for his death. Unsurprisingly, the heartbreaking story remains as electrifying today as it was 27 years ago, and does a good job of staying true to the original film. In fact, Bruce Joel Rubin who wrote the original screenplay also came on board to write the musical's book and contribute lyrics to the songs by Glen Ballard and Eurythmics' Dave Stewart. Ghost's music is wonderfully moving, especially With You, the hauntingly beautiful ballad sung by a heartbroken Molly as she tries to come to terms with her loss. Thankfully, there are some lighter numbers in the show too, with Oda Mae's introductory song Are You A Believer being particularly entertaining, thanks in no small part to the fantastic performance given by Jacqui Dubois, who steals every scene she appears in as the reluctant medium. Additionally, Carolyn Maitland and Andy Moss make a sweet couple as Molly and Sam. While Maitland does a lot of the heavy lifting in their duets and showcases her crisp and powerful belt consistently throughout the show, Andy Moss also manages to pack a punch during big numbers such as Rain/Hold On and I Had A Life. 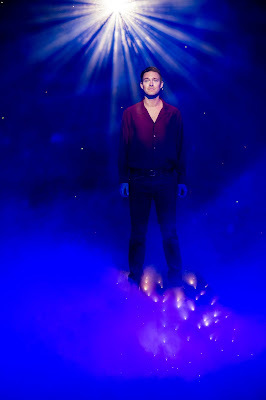 The latter is one of the most effectual songs in the show, which allows the lead duo, as well as Sam Ferriday as Sam's conniving friend Carl, to shine, while also laying the groundwork for a high stakes second act. Unfortunately while the show is well cast it is slightly let down by serviceable yet slightly soulless sets which feel a bit bare-bones, as well as rather cold and clinical. Several more intimate scenes feel a bit lost amongst such sparse scenery, which is disappointing for a musical which is first and foremost a romance. Even when the full ensemble is on stage it feels as if there is too much unused space on stage. There's no doubt that this production would benefit from a slightly larger ensemble cast, as even the large group numbers feel a little bit lost, although the vocals are strong throughout. Additionally, barring one or two impressive special effects, Sam's ghostly activities are also a little bit underwhelming. His initial transition from living to spectral is a simple yet effective moment which elicits a few gasps here and there, but sadly there is a surprising lack of ghostly activity. The cast all give great performances, and it's hard to resist Ghost's tear jerking finale, and ultimately it's the production design and effects that let it down. Some tightening up, a fuller ensemble and the addition of a few more awe inspiring effects could really help to enhance this tour. However, there's no doubt that it is an entertaining evening out as it is, and there is still a lot to enjoy about this musical in terms of songs and characters, especially for those who love the original film! Catch Ghost as it tours the UK this year. Visit www.kenwright.com/microsite/ghost-the-musical for more information.